NEW BRUNSWICK – Puma Exploration, headquartered in Rimouski, Que., continues to drill its Murray Brook polymetallic property 60 km west of Bathurst, and not only are the holes returning high zinc-lead grades, but indications of a new high grade gold mineralization as well. 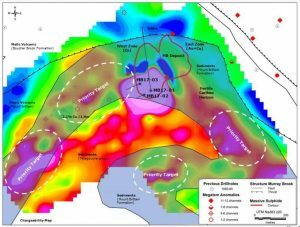 Hole MB17-01 intersected over 405 meters of continuous massive sulphide mineralization starting from 27 meters from surface and extending to a depth of 435 meters. The overall grades are 3.3% zinc, 1.1% lead, 0.95 g/t gold, 42 g/t silver, and 0.30% copper including a high grade gold zone of 2.0 g/t gold over 160 meters. The hole also included several high grade zinc intervals as high as 10.04% with3.23% lead, 2.62 g/t gold, 119 g/t silver and 0.56% copper over 17 metres. Puma will use this and other exploration results as it refines the mine plan and preliminary economic assessment for the property. A 200- to 300-kg sample of fresh core is also being collected for metallurgical recovery studies. Detailed information from hole MBC17-01 is posted in the Oct. 31, 2017, news release at www.PumaExploration.com.